Hello! I can’t believe that June is almost over! I just finished and submitted the last few assignments for my summer classes. That means, I am on summer break! 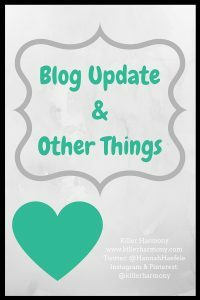 I’m excited to announce a few exciting blog type things happening at Killer Harmony in the next few weeks. Read on the find out more! These next couple of months will be great for the blog. Since I am done with classes, I can now dedicate more time to blogging. I can also spend more time connecting with all of you! I also have been working on a few more exciting things related to the blog. Since I have a bit more time now, I am going to try and keep up with two posts a week for the next few weeks. I would love to continue with two posts a week into the fall, but I will be a senior. I will have a lot going on from marching band to planning and playing two solo recitals (I’m a music major if you didn’t know) and keeping up with writing for my school paper. If I can get enough posts written and scheduled before mid-August, then I will continue with two posts per week. I will update you on social media, so be sure to follow me! I will always do my best to have a post up on Mondays. I don’t have any plans to change that. I will also post something on either Thursday or Friday when I have something. I spent a lot of time reading all about WordPress, and I finally decided to “bite the bullet” as they say and switch from Blogger to self-hosted WordPress. I now know why people say switching is the best thing you can do for your blog, because it really is. I decided to go with SiteGround (affiliate link) for my web hosting, and I could not be happier with my decision! They are currently having a sale where you can get hosting for up to 60% off the normal price! I do think that self hosting your own blog or website on WordPress is not the best for a beginner. I am still learning the quirks of the program. If you want to start a blog and see if you like it, I would suggest Blogger or WordPress.com (free WordPress). I have been posting on Instagram each day in June for my goal challenge. You can learn more about that here, but I definitely plan on continuing the daily posts into July. I might make a monthly theme, but we will see. I am really loving social media right now, so if you want to follow me, the links are on the side of this blog or in the image toward the top of this post. I post on Twitter throughout the day, everyday. I post about my blog and business, but I also like to give little snippets into my personal life. I like posting a bit of personal stuff, because I can show you guys that I am a real person. I am also on Pinterest. I like to post my own stuff as well as posts by other bloggers. My pins seemed to lose their links in the process of switching my blog over, so I need to do some maintenance. I hope to get everything working again soon, though. I am so excited to start working on some back to school posts, because I am one of those nerds who loves back to school. Unless I go to graduate school, this will be my last back to school season (tear), so I want to make it a good one. If you have any requests or ideas for blog posts, please let me know! I would love to write stuff that you need/want! Let me know in the comments or on social media what you would like to see. I would also love to hear from you guys in the comments on what you have enjoyed most from my blog. I want to make it better and better. This blog is for you, so please share your thoughts with me! So, you might be wondering what classes I took this summer. Well, I decided to take two. At my university, I need a certain amount of “residence” credits to graduate. That means that I need to take a specific amount of classes from that university. Since I transferred, I am cutting it a little close with that requirement. The classes I took this summer and the class I took last summer will help. I am almost positive that I will graduate next May! First, I took an ethics class, which was very interesting. I had readings over everything from the basics of morality to animal rights. The class covered a lot of cool stuff, and I enjoyed it. The class also had no tests, which was a big plus! The other class I took was Intro to Music Tech. This class will fulfill a computer science general education requirement. I am so glad that I could take a music class for that requirement. If you can, I would suggest taking classes as related to your major as you can. Thanks for reading! If you want to subscribe for exclusive content, I am working on a newsletter to be released soon, so sign up below! I hope you have a wonderful senior year! When you get all the links fixed on other social media and everything switched over, a blog post about the process (including all the little things a blogger might not think of) would be appreciated. Thank you! I’m excited yet also sad about it being my last year in school. And, I will definitely work on a post about the whole link/social media switching process!